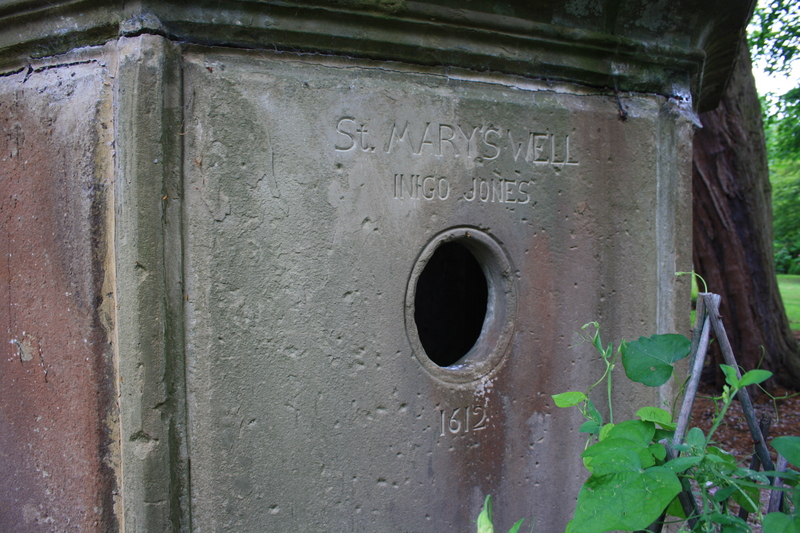 Rhuddlan’s St Mary’s Well lies in the grounds of Bodrhyddan Hall, a mile or so to the east of the town. The well sits virtually on the boundary between Rhuddlan and Diserth parishes, the parish border is marked by a stone set in the floor in the Hall.The hall is the home of the Rowley-Conwy family, and in private ownership. House and gardens are open to visit however on Tuesday and Thursday afternoons during the summer. A house has stood on the site for some 700 years, however the present building dates from the end of the seventeenth century, though very largely remodelled in the 1870s. It is the later Victorian sections that you get to see on the hour long guided tour. The tour reminds one of nothing more than when Elizabeth Bennett is being shown around Pemberley; with our guide,in the role of the aged housekeeper, reeling off lists of ancestral portraits and recounting stories of how the various treasures on display had been accumulated by the collectors and hoarders of the family; whilst ensuring that we don’t tread where we shouldn’t or stray too far from her breathless accounts of family history. The gardens may be visited independently, for a lesser charge, though the historical interest and entertainment provided for the extra couple of pounds for the house tour is well worth the money. 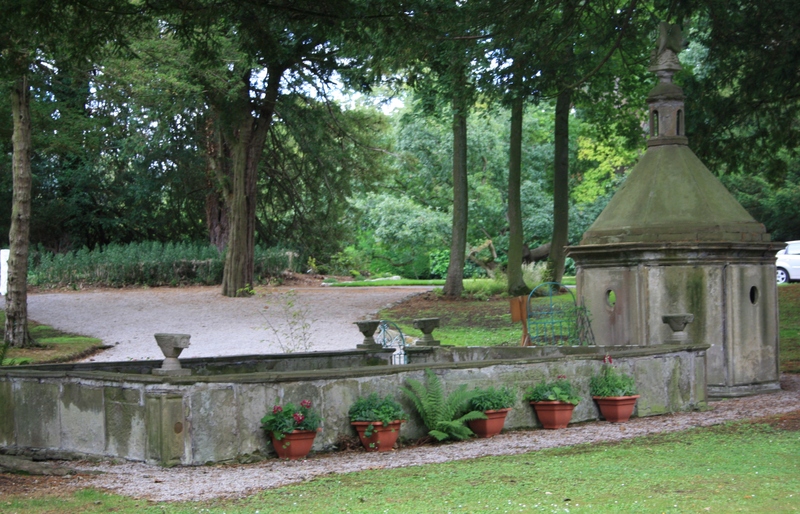 The well itself is quickly found, just to the left of the main drive as you approach the house. 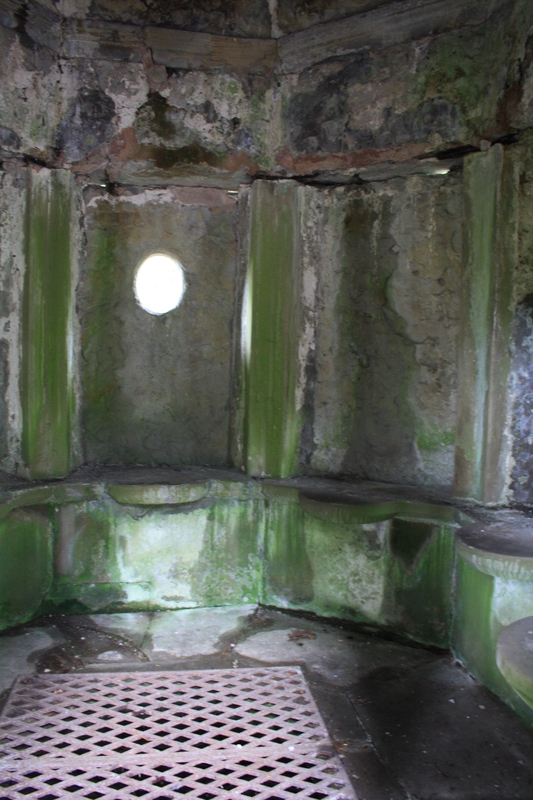 It is enclosed within an octagonal stone chamber, with seating around the inside. 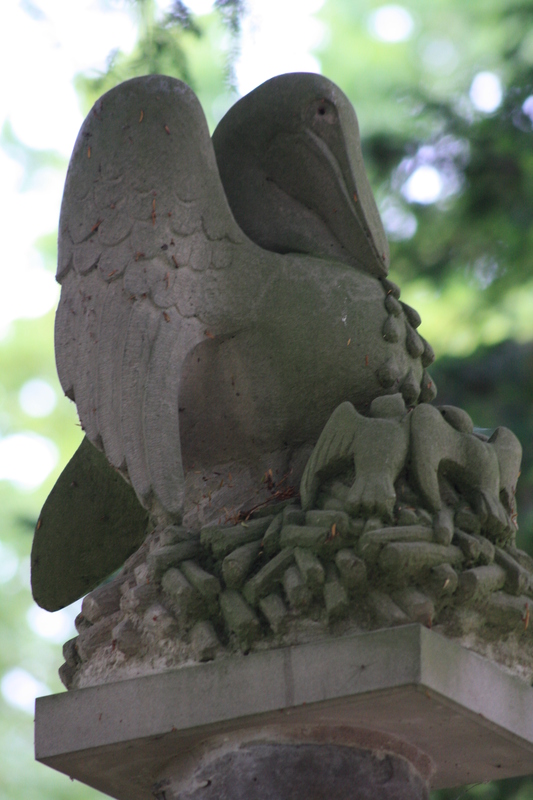 It is roofed, with a carved pelican at the top. A grating in the floor covers the spring, through which many coins have been thrown, in response to the paper sign hanging by the door proclaiming the site to be a wishing well. 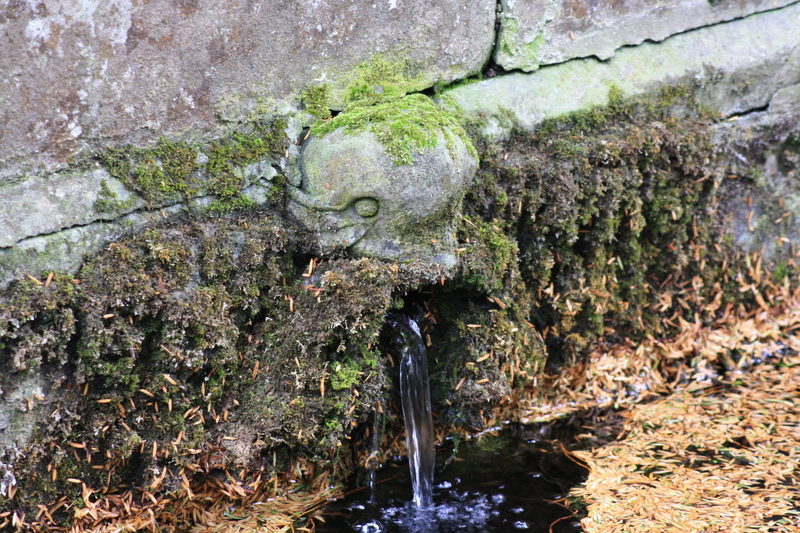 Water from the spring drains through a carved fish head into the adjacent stone lined bathing pool. The well is recorded by Lhuyd in 1699 as Ffynnon Fair in Rhuddlan parish. It clearly thus has a sustained history of usage. There are stories of it, in common with other such wells, being the location for clandestine marriages at times in the past, though we note here that the term “clandestine” need not necessarily mean secret, merely that they were without official proclamation and outside the more usual church setting. The existing building bears, in large letters, its troublesome attribution as being the work of celebrated early seventeenth century architect Inigo Jones. It would appear generally accepted now, that the building is not the work of Jones. CPAT (ref. through Archwilio on links page) suggest that it may date from the late 17th or early 18th centuries, which would make it coeval with the redevelopment of the house at that period. Moreover the ancient monuments record points out that it does not appear to be depicted on an estate map of 1730, whilst present in 1756. Tucker (1961) also suggests that the lettering style is not that of the period. The area around the well was developed into a pleasure garden for the hall, with groves, fish ponds and walkways, and the well house would have formed a central feature within the garden layout of the time. 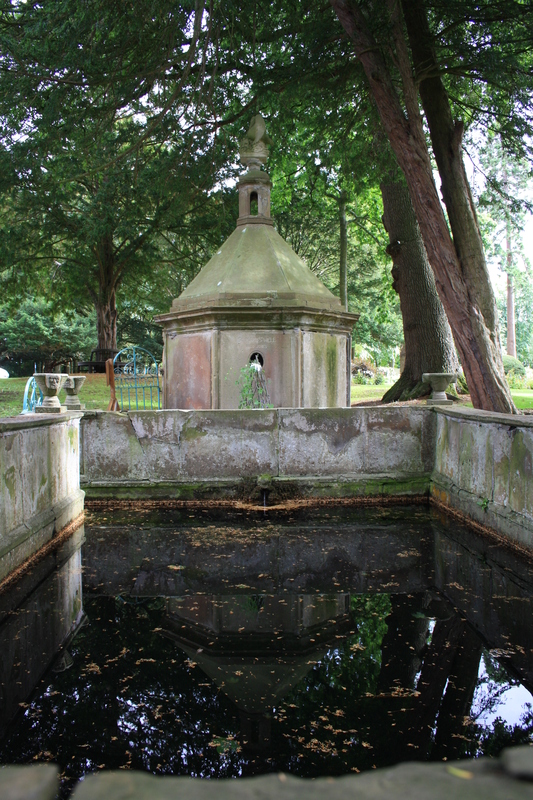 It is possible that there has been a tradition in the family that Jones, who would have been 40 in 1612 and by that time a noted architect in London, played a role in designing earlier gardens at Bodrhyddan , and this has been recorded at a later period at the well, possibly giving the idea of a longer continuous history to the hall following its rebuilding at the end of the seventeenth century. Questions concerning the date of the building and its designer aside, there is no doubt that the spring at Ffynnon Fair, Rhuddlan has a lengthy and significant history, and in its present guise is a picturesque site to visit. Definitely an excellent house tour – you don’t get that level of attention from the National Trust! !